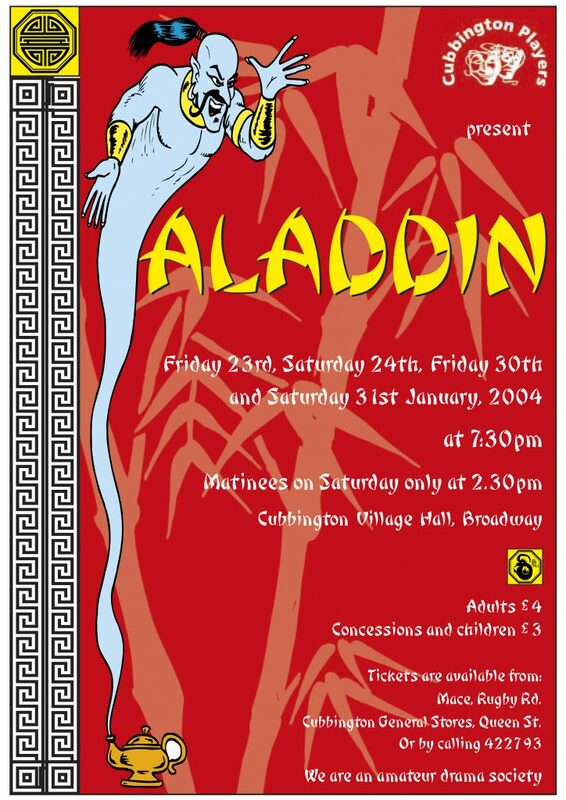 The Cubbington Players bring a bit of belated Christmas magic to the village hall in the pantomime Aladdin. Not performed by the group for about 13 years, the script is much updated with topical gags, songs and tricks which are well received by the audience. Worth particular mention is Mike Crawshaw as Dr Rick-Shaw, the detective whose failed attempts to catch the evil baddie Abanazer, played by Mark Frampton, are hilarious. Ruth Bishop as Ty-Ping is also very good, as is Joseph Hughes as Dame Widow Twankey. A good balance of songs and acting keeps the play moving along at a nice pace making the evening spent at Widow Twankey’s Swankey Pantry a most welcome break from the January cold outside. If children’s shouts and cheers are an accurate measure of success, then this version of panto favourite Aladdin must have broken box office records. Even so, I couldn’t help but feel a little disappointed with Cubbington Players’ latest show. It wasn’t because I was told there may not be a seat for me as the hall was so full; it wasn’t the fact that the play was two-and-a-half hours long (in my opinion far too lengthy for younger children); and it wasn’t even because I didn’t get a lollipop. Perhaps my expectations were too high considering the standard of previous performances – but Aladdin just missed that x-factor. Something was missing, that magical something all pantomimes need in order to make them work. It wasn’t a complete failure, but neither were there any obvious stars this time round. Mark Frampton and Ruth West as Abanazer and Vellee-Smellee redeemed the show somewhat, and there was a good attempt at Christina Aguilera’s Genie in a Bottle by Victoria Perris. Fiona Broadhurst and Joseph Hughes were entertaining and the whole thing was well written. The youngsters had a whale of a time, and that, I suppose, is what it’s all about. So Cubbington Players – I still have faith in you. But next time I want a lollipop. 6/10.